The Wachau Valley is located in Austria. It is about an hour away from the capital city of Vienna. This makes the Wachau Valley a perfect place for a day trip or a weekend getaway from Vienna. The valley is located between the towns of Krem and Melk in Austria and the beautiful landscape is formed by the river Danube. The Wachau Valley is very European- in the sense the countryside reminds you of historic times with rivers, castles and churches that spring every now and then as you drive along the 25 mile road stretch. The entire valley was listed as an UNESCO Heritage site in 2000. That gives you another reason to visit this gorgeous valley. The towns and landscapes of the Wachau Valley have survived the test of changing times, whilst keeping the natural evolution intact. 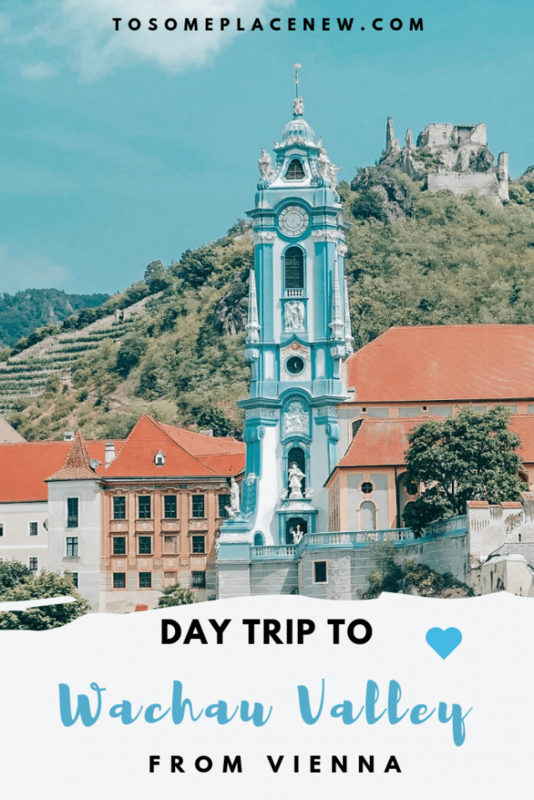 How to get to Wachau Valley Austria? There are many ways to get to the Wachau Valley. Easiest way is to arrive in Vienna (or Vienna International Airport, if flying from overseas). Once in Vienna, you can rent a car and drive to Wachau (about 1 hour). There are morning trains available from Vienna to Wachau and it costs about 15 Euros. Westbanhof is a train station connects Vienna to the countryside. This station has city trains as well as ‘rural’ trains which are called OBB trains. Traveling to Wachau is possible by local transit as well. It does take 2.50 hours and the journey is a combination of transit train and buses. Once you have arrived in Wachau, you can explore the valley on bike, via cruise or by driving along. You can also book for a full day tour from Vienna to Wachau Valley which includes sightseeing as well. 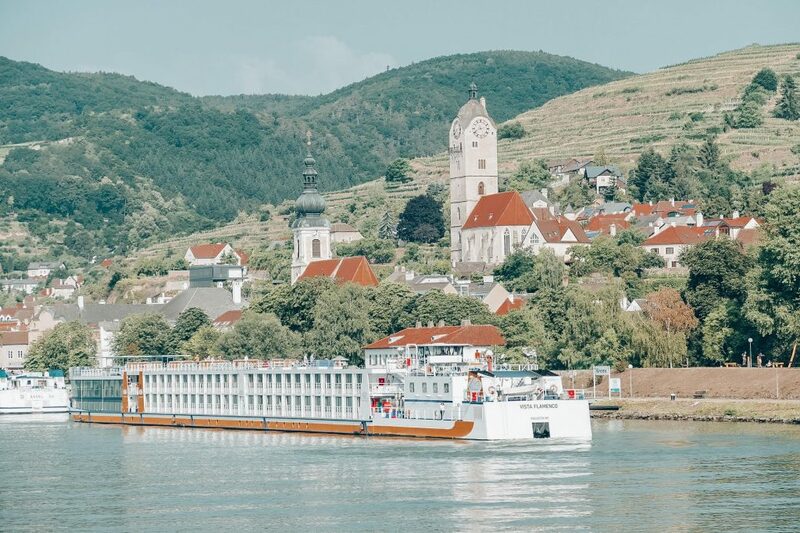 A cruise lasts about 3 hours+ (return trip) and you can explore both Krem and the Melk towns. There is an amazing combo ticket which includes the transport fare from Vienna, cruise and entrance to the Dürnstein Castle . We drove to the Wachau Valley with a local guide. The drive was scenic and we got down at the Abbey and had pit-spots along the way, covering a few churches, vineyards and river-banks along the way. Early summer or autumn is the best time to explore the Wachau Valley and experience the beautiful greenery. We visited during early spring in March and depending on the forecast, some days could be gloomy and rainy! For an overnight stay or longer, you can book your accommodation here in the valley. Hotel rooms range from $150 USD to $300 USD+ depending on the luxury level and the amenities it offers. Need more options for hotels in Wachau Austria? We were staying in Vienna for a few days and we decided to visit the nearby Wachau Valley. We say, nearby because – 1 hour drive is not a LONG drive for us. The weather was overcast and was slightly raining that day. This made the valley even more beautiful and serene. We visited the Wachau Valley in the month of March and the tourist season had not picked up yet. This allowed us to take tons of pictures in the Melk Abbey and spend ample time there. The Wachau Valley is beautiful because its lined with greenery on all sides of the road, with hills and castles in the far distance and the river flowing alongside your road. Isn’t that romantic already? Definitely consider pit-stops to take pictures or walk by some of the water banks or mini-ports to soak in the beautiful nature. The Wachau produces one of the most popular white wines in the region. The Danube has an extremely diverse geological terrain and along with its waterway through terraces makes cultivation of vines on these inclines very unique and pictureque at the same time. Many of the region’s wineries date back to 17th and 18th century. The Wachau Valley region has about 124 vineyards and 650 growers cultivating on 3300+ acres of land. The Melk Abbey is one of the biggest baroque abbeys in Europe. It is a Benedictine abbey located in the town of Melk adjoining the Wachau valley. The abbey is striking with its bright yellow color painted all over. The abbey is a living monastery and is inhabited by monks. This abbey was originally built to serve as a royal palace. There are remnants of the Austria ruling dynasties and their rulers that are housed inside the abbey. It is believed that Maria Theresa received 40 kg of gold and it is preserved in the abbey. The entrance of the abbey is decorated with golden leaves and white marble statues. A visit of the monastery includes the Imperial Staircase, the Imperial Corridor, the abbey museum, the Marble Hall, the balcony, the library and the abbey church as well as the abbey park with its Baroque pavilion. You can capture amazing shots from the panoramic terrace and also visit special exhibitions held in the abbey. By walking through the lobby you will enter the Stiftskirche which was the church dedicated to St John, the Baptist. The ceilings are decorated with beautiful frescoes. 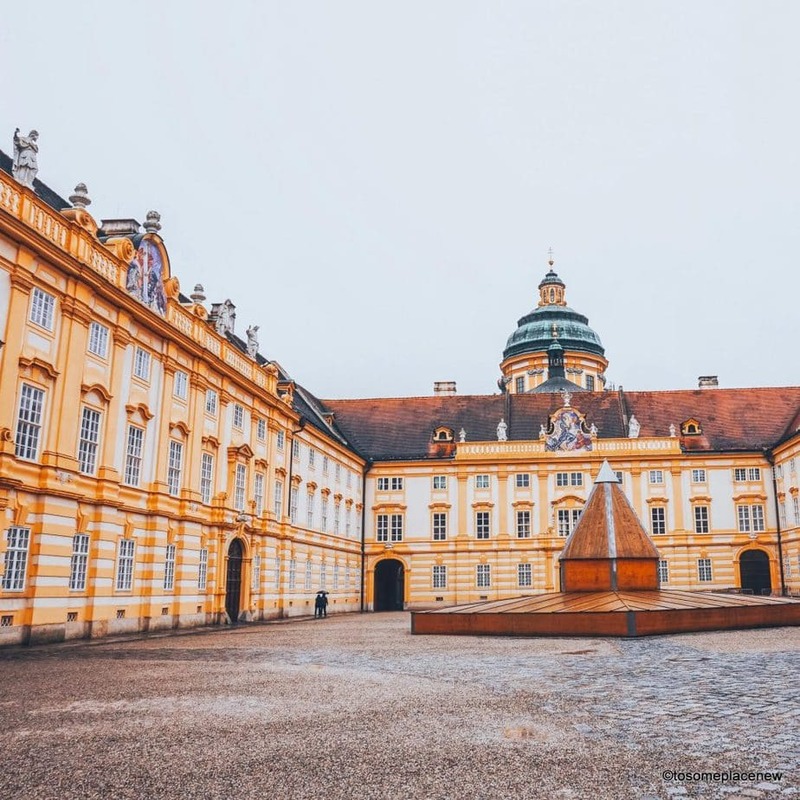 Built in the early 1700s as a royal palace, Melk Abbey was eventually gifted to Benedictine monks who turned the estate into a fortified abbey. After exploring Melk, it is a good time for some lunch, before heading to Krems. There are many ways to reach Krems from Melk. It is about an half an hour drive from Melk. If you are using the train, you will reach Krems in 1 hour. There are also boat tours from Melk to Krems and back, and this is a great opportunity to enjoy the river Danube. If you driving to the Wachau Valley, explore Melk first and then take a boat tour to Krems and back, to enjoy the scenic Danube river ride. Book your boat tour from Melk to Krems. Schloss Schönbühel is a medieval castle, that you will most likely see by the Danube river banks. on your boat tour. This castle was built in the 12th century in the town of Schönbühel-Aggstein. The castle is situated on a rock (40 metres above sea level), just like the Aggstein fortress (which is in ruins). The castle was built as a defensive fortress in the 12th century. Its owner and builder was Marchwardus de Schoenbuchele. After him, the castle had passed through the hands of many owners. It stayed with the Starhemberg family for over 400 years, and later sold to Count Oswald von Seilern und Aspang. The Aggstein fortress was built in the early 12th century. It was built with an intention to monitor the traffic coming and going from the Danube river. The fortress was built on the top of a narrow ridge, 480 metres above sea level. The castle is in ruins now, but it offers breathtaking views of the entire Wachau Valley. The fortress has hidden stairways, courtyards and towers including a dungeon and a chapel which makes this place a great spot to explore the by-gone days. Durstein is one of the stunning towns located in Krems, in the lower Danube river. 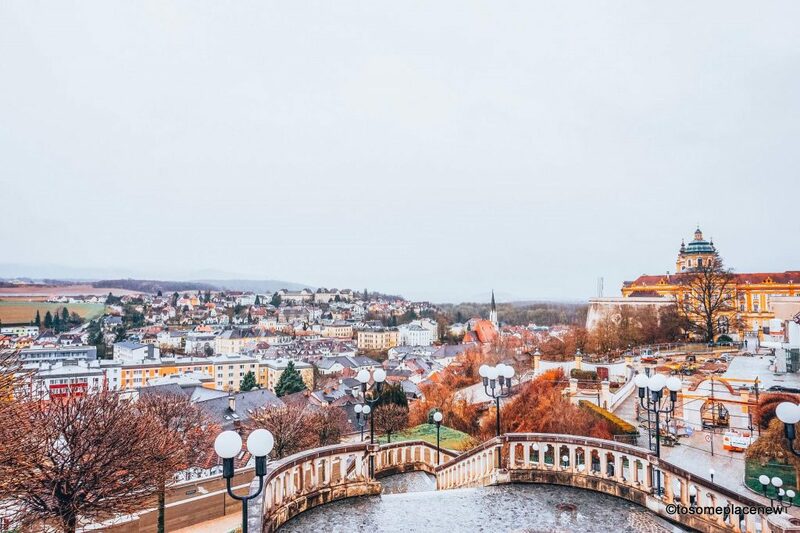 This small town is very picturesque with its blue baroque cathedral tower, medieval castles, and of course the river valley itself. There are quiet a few things that you can explore here. One of them is the Dürnstein Castle. Dürnstein Castle is a medieval ruined castle, situated at 315 metres above sea level. The castle that you see at the background is the Durstein Castle. The rock castle was built in the 12th century, but was destroyed in the 17th century. This castle is known for imprisonment of King Richard I of England, who was kept captive here. Although an abandoned castle, the Dürnstein castle is an UNESCO Heritage site, along with the Wachau Valley. The beautiful blue colored cathedral tower will definitely catch your attention in Dürnstein. The Blue Monastery Church was built in the 1700’s and is one of the finest baroque towers in the whole of Austria. Guided tours are available at the abbey. There are beautiful paintings and sculptures inside the church. The church is open for prayers. Enjoy the evening stroll and the small town beauty! Dürnstein and the Wachau Valley in general is not touristic. It is not crowded like Vienna or Prague. But we assure you it is very beautiful, natural and is packed with history and typical medieval European vibes. Enjoy a romantic evening stroll or bike around the small towns and absorb all the serenity. 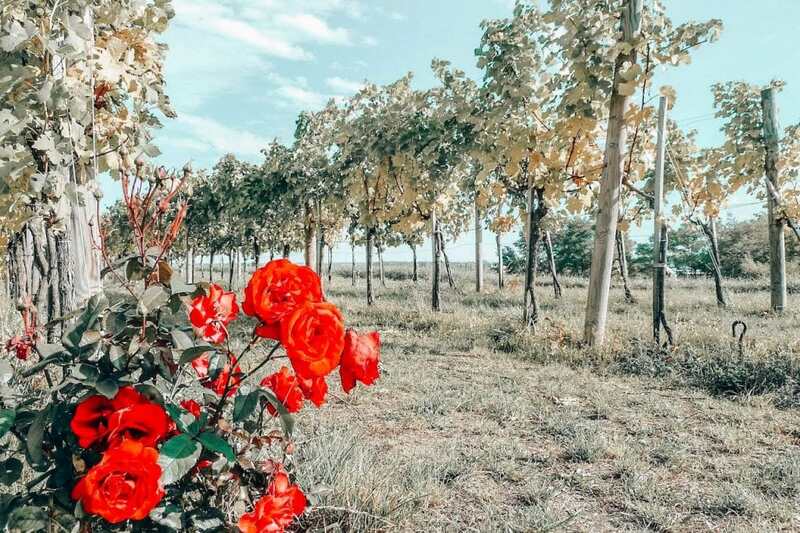 If you are staying in Vienna for 3 days or more, consider traveling to the Wachau Valley for a day and experience the beautiful Austrian countryside, you wont want to leave. 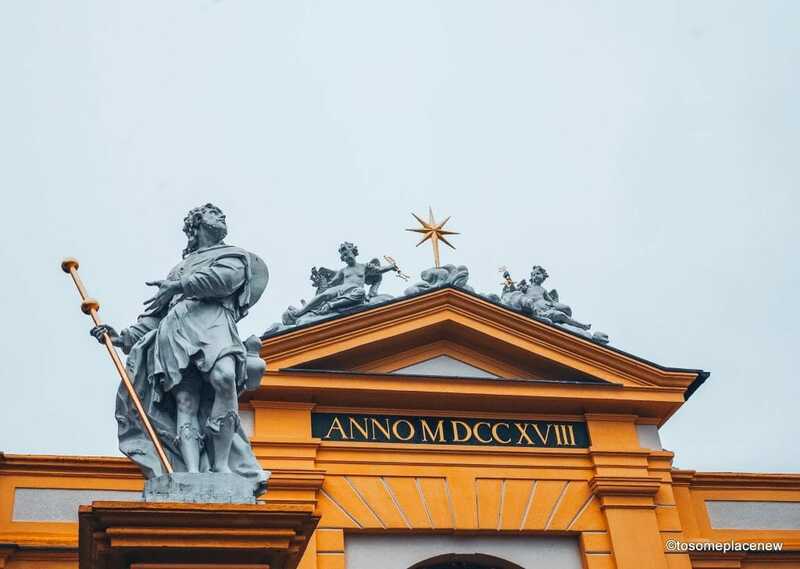 I’d never heard of Melk Abbey before but it looks stunning – I really need to explore more of Austria! I need to go here! Austria is my favourite European country. I didnt make it here though. 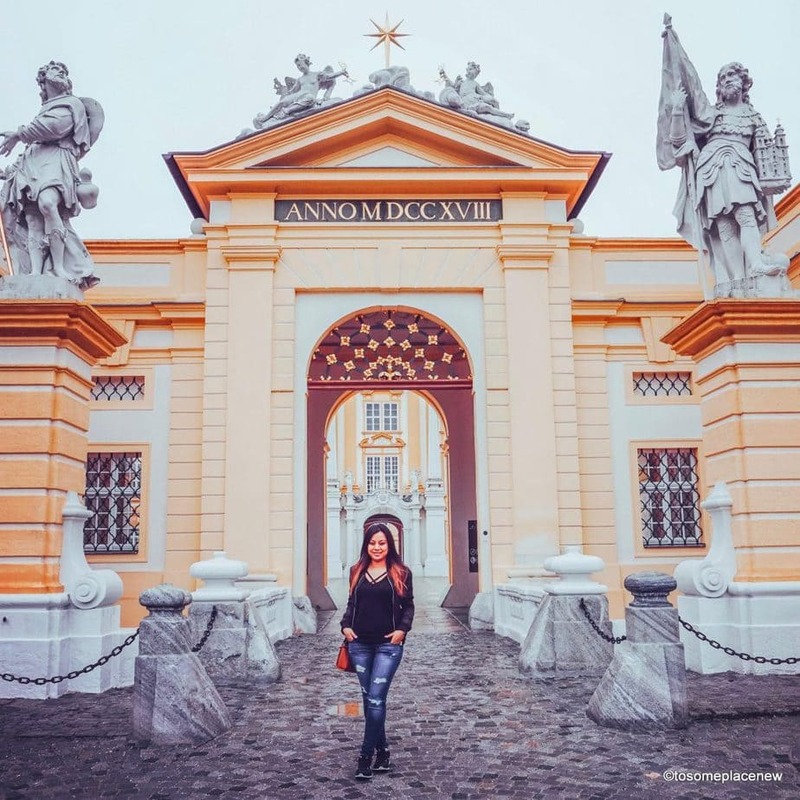 Just Innsbruck, Salzburg and Vienna – a trip back is needed! I need to go here! Austria is my favourite European country. I havent made it here but have seen Innsbruck, Salzburg and Vienna. Now i need to go back! Definitely visit the Wachau Valley, I am sure you wont be disappointed. The romantic road is beautiful as well. You have no idea how much I love the Wachau Valley. I have cruised the Upper Rhine Valley and I think the Wachau Valley, which is less known, is way more spectacular. We spent a day there (from Vienna) but would like to visit back and stay on the area several nights. That’s so nice to know! We were there for a day trip, I bet it will be amazing to stay for several nights! Oh, it’s such a shame I didn’t find this post before going to Vienna! Wachau Valley looks so sweet. I love the architectural style. And it’s definitely not far from the capital! This is so pretty! I didn’t get to visit when I was in Austria, but will visit on my next return. Thanks for sharing your experience. OOh Wachau is one of the few places in Austria I have not been! The Melk Abbey and the vineyards look lovely. I would love to go back to Austria one day and I will have to squeeze a visit to the Wachau Valley on now. I would definitely recommend the Wachau Valley if you are visiting Austria again. The countryside is so pretty! I would love to try a bike ride there in spring before the tourist arrive! What an absolutely stunning place! I have never heard of Wachau Valley but s going on my list when I’m in Vienna. Love that the entire valley is UNESCO heritage listed. The abbey looks incredible and I’m a wine lover so I’d definitely be interested in a wine tour. Gorgeous pictures. Thanks Amy! Seems like the perfect place for you. We loved it, so will definitely recommend! Omg this makes me want to visit ASAP!! Looks really beautiful. I’m adding it to my growing list! Woooow! 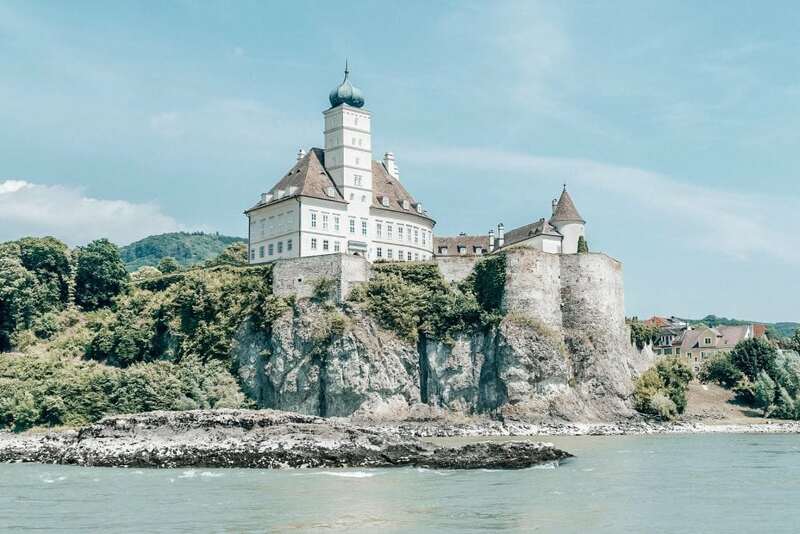 I LOVE seeing castles, and these Austrian medieval castles look fantastic! The view from Schloss Schönbühel from the river is particularly gorgeous! Gorgeous! The cruise and winery sound especially fun. I love Austria and need to check this out soon! I fell like everyone thinks of Vienna and the Alps when they think of Austria, but there’s so much to see in between! There are some stunning locations in this post, especially Aggstein Fortress. Would love to get back to Austria some day. I’d never heard of the Wachau Valley before, but *wow* are those pictures gorgeous! Yet another beautiful place to add to the ever-growing list 🙂 Thanks for the guide! Thanks so much! I am sure you will love Wachau!